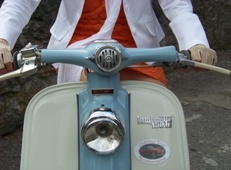 A curious two-stroke vehicle appeared in England in the beginning of the 20th century: the scooter. 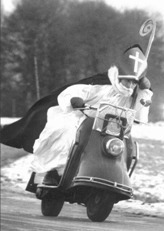 The innovation was directed to the needs of busy priests and modern ladies with the purpose to allow riding a motorcycle in spite of long garments. But without any success. Who would ever have thought that this bizarre invention, newly interpreted in 1946 in Italy, was going to influence decisively an era by its ingenious and creative image of the “Bel Paese”. Vespisti and Lambrettisti used to face one another in an amusing rivalry, comparable to “Don Camillo and Peppone”, Inter and Juventus, or The Beatles and The Rolling Stones. 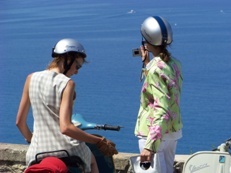 Both of them began to break free on the Italian Sundays whizzing through the beautiful countryside and generating a collective psychological phenomenon of having fun. Rather unconscious creators of a new popular habit, or passion, which they were now able to share: Tourism. Times have certainly changed. But today the fascination of these two “antagonists” has even increased. They are charming, seducing and transmit an incomparable idea of elegance and glamour consolidating a piece of history and of Italian life-style in the world.